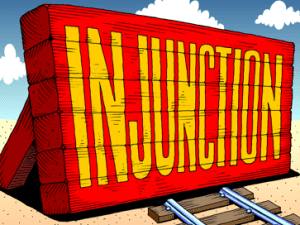 An injunction is a court order directing a person to do (or stop doing) something. If someone violated your NDA, you would want a court order directing that person to stop using your secrets. To get an injunction, you must demonstrate to the court that you have suffered or will suffer irreparable harm as a result of the unauthorized use of your secrets. Irreparable harm is harm that can’t be compensated for later by money. Proving that in court is expensive and time-consuming. In order to cut through some of that legal work, some nondisclosure agreements include a provision similar to the Example below. In it, the receiving party agrees that the harm caused by a breach is irreparable, so you will have less to prove if and when you seek a court order. This provision only makes it easier to obtain an injunction; by itself, it will not compel a judge to order an injunction. In other words, don’t expect that a judge will automatically stop the disclosure simply because this provision is in your agreement. To get an injunction, you will always need to demonstrate that you are likely to prevail in your dispute. That said, this clause provides some tactical advantages and it’s a good idea to include it. Receiving Party acknowledges that any misappropriation of any of the Confidential Information in violation of this Agreement may cause Disclosing Party irreparable harm, the amount of which may be difficult to ascertain, and therefore agrees that the Disclosing Party shall have the right to apply to a court of competent jurisdiction for an order enjoining any such further misappropriation and for such other relief as the Disclosing Party deems appropriate. This right of Disclosing Party is to be in addition to the remedies otherwise available to Disclosing Party.